… “any resemblance to reality is nothing but coincidence,” professes the playbill a new production in Paris that reimagines the fateful encounter that wrecked the presidential ambitions of Dominique Strauss-Kahn, the former International Monetary Fund head. Thus writes Doreen Carvajal from the French capital in the International Herald Tribune of a play on DSK whose Sofitel run-in with the maid is elsewhere in the news. Called “Suite 2806,” the play is a sly wink at reality with occasional facts changed. Its title comes from the number of the room where Mr. Strauss-Kahn was accused of sexually assaulting a West African immigrant maid named Nafissatou Diallo, whose credibility was later discounted by legal authorities. No doubt many French, Mr. Strauss-Kahn not least of them, wish that the D.S.K. affair, as it is known here, would simply go away. But the play’s sold-out premiere this month was a measure of France’s lingering fascination with a case that has caused a societal reflection on money, privilege and power — particularly as it relates to the sexes. … A majority of newspaper readers responded “oui” to various online surveys that asked if they were shocked by the D.S.K. affair’s becoming the subject of a play. … For the stage drama, the names of the two key characters are changed to Daniel Weissberg and Evangeline. And the actual nine-minute encounter in New York has been stretched to more than an hour in a duel of words and psychological torment. Guillaume Landrot, 42, the author of the play, said he wrote the script in a burst of inspiration in one month after Mr. Strauss-Kahn’s arrest in New York in May 2011 on charges that were later dropped. That would be enough to merit a No Pasarán post, and this post might stop at this point — except that we again get the usual French comparison of a comparatively banal event to the mass murder of 3,000 Americans on 911. … But there is no doubt about who the characters represent, especially as portrayed by Eric Debrosse, who bleached his hair white and gained more than 13 pounds on a diet of sausage and French fries. To master Mr. Strauss-Kahn’s signature sidelong glance and papal wave, he studied videos and speaks in slow, professorial tones. Klaus Schütz, mayor of west-Berlin from 1967–1977 has passed away at the age of 86. For four years, he was the ambassador of the Federal Republic of Germany to Israel. In 1981 he took over the directorship of the Deutsche Welle, and in 1988, he was appointed director of the National Institute of Broadcasting in North Rhine-Westphalia. After his retirement in 1992 Klaus Schütz returned to Berlin to take up journalistic tasks and activities as president of the Berlin State Association of the German Red Cross. 1946 Klaus Schütz enrolled at Berlin's Humboldt University majoring in History and German Literature. He joined the Association of Social Democratic students in 1947 and belonged to the student council. Soon thereafter, he was a delegate to the National Committee of Young Socialists in Wilmersdorf (a neighborhood in west-Berlin) for the SPD. When, in June 1948, three students were expelled by the administration for plagiarism at Humboldt University (in the Soviet sector, and under suspicious motives) he along with other members of the student council took action and and moved to the Free University in the American sector. From 1949-50, he completed a political science postgraduate studies at Harvard University. The years that he was in the Mayor’s office were relevant ones. A kind of détente was developing, and border crossings opened, which relieved some of the hardship separated families endured. A political kinsman of Willy Brandt, he aided in the building of the fine-line between defiance to the DDR and Soviet policies, and an unavoidable need to engage with them. They were the years a kind of normality was developed in the life of West-Berlin, albeit one that eternally seemed temporary, even at the hands of DDR inspired western radicals who went so far as to kidnap his election opponent, and then make demands of him, not to mention the cruel practices of leftist totalitarians. They were not easy times. More demonizing of the Tea Party in France, as Le Monde's Christian Salmon mentions the dangers of the " 'no worries' right nourished with the neo-conservative milk which flirts at times with the extremism of the ultra-conservative Tea Party". Loin d'en faire l'analyse, l'UMP a mis en scène un conflit d'ambitions, un débat entre deux styles ou deux tempéraments, occultant le profond clivage qui existe entre une droite "décomplexée", nourrie au lait néoconservateur qui flirte parfois avec l'extrémisme du mouvement ultraconservateur Tea Party, et un gaullisme social désormais hors sol. Quand vous entendez l'expression "ultralibéralisme", il y a quatre hypothèses. • Primo, celui qui prononce ce mot est "ultra-stupide" (exemple: "la politique ultralibérale de l'Union Europénne"; "la politique ultra-libérale du gouvernement Sarkozy). • Deuxio, celui qui parle est "ultra-ignorant" et n'a aucune idée de la manière dont se structure le champ des idées et doctrines politiques. • Tertio, celui qui parle est "ultra-intolérant". Le préfixe péjoratif "ultra" a évidemment pour but de disqualifier d'emblée une personne qui intervient dans un débat, raison pour laquelle la gauche médiatique se sert abondamment de ce terme. Par contre, on ne parlera jamais "d'ultrasocialisme" ou "d'ultraécologisme". • Quatro, celui qui dit cela est "ultra-conforrmiste" et, faute de disposer du goût ou des capacités pour réfléchir par lui-même, il se contente de répéter, par un réflexe moutonnier, cette expression utilisée par les trois premières catégories. The nation’s leading conservative newspaper ousted its top editor, apparently hoping to ingratiate itself with the new government. A cultural magazine brought in a new editor as well, opting for the partner of a newly minted government minister. Thus reports Scott Sayare from Paris, in an article the New York Times entitled Where ‘In Bed With Media’ Can Be Taken More Literally. (See also Le Monde's Les Liaisons Dangereuses). The man she replaced took a job working for the new president. The springtime election of François Hollande, the first French president from the left in 17 years, has brought about a shuffling of the news media ranks, along with a host of potential conflicts of interest. Coverage has shifted too. Much of the news media, which largely lean left, used to revel in denouncing Mr. Hollande’s predecessor, Nicolas Sarkozy, but now many journalists are feeling bereft of material because of the new president’s less dramatic governing style. Mr. Hollande has proved confoundedly boring, they say, especially for news outlets that sometimes cover the government as if nothing else matters, relying on Paris politics to drive the news. The line between politicians and the news media can be blurry in France, where the fates of some journalists have long been hitched to those in the government they pester or please. Mr. Sarkozy’s close ties to media executives were considered something of a scandal, and his presidency drew greater scrutiny to the incestuous relationships. Mr. Hollande campaigned on a pledge to be “exemplary.” But in a country where much of the Paris elite share a common background, attended the same schools and go to the same parties, the traditional commingling of journalists and politicians has endured. Daniel Carton, a former reporter in France, blames the news media for not doing more to resist such close ties. “They know exactly what they need to do to avoid things getting out of hand, but they won’t do it,” said Mr. Carton, an outspoken critic of conflicts of interest in French journalism. For decades, newspapers have relied heavily on state subsidies. The public media, which account for perhaps half of mainstream television and radio news, are still run by political appointees. Private media outlets belong to companies or investors with demonstrated political leanings or business connections to the state, undermining journalistic impartiality. Perhaps most striking this election cycle was the situation of Étienne Mougeotte, whose run as top editor at the rightist daily Le Figaro began and ended with the presidency of Mr. Sarkozy, the politician he championed and whom he was said to advise. “We’re a newspaper of the center and the right, and we support Nicolas Sarkozy,” Mr. Mougeotte told the center-left Le Monde last year. Under Mr. Mougeotte, Le Figaro was routinely criticized, sometimes by its own reporters, as being a mouthpiece for the government. Mr. Hollande was said to have requested Mr. Mougeotte’s dismissal, according to French media reports, and it came in July. The publisher, Serge Dassault, is a senator from Mr. Sarkozy’s political party. But Mr. Dassault also heads a major military contractor, and there was widespread speculation that Mr. Mougeotte’s ouster was meant to put the Daussault group in good stead with the new president. The news and culture magazine Les inRockuptibles hired as its new top editor Audrey Pulvar, a radio and television personality who was also the partner of Arnaud Montebourg, a government minister and a prominent member of the Socialist Party. Mr. Pulvar recently announced the end of her relationship with Mr. Montebourg, but other such relationships have continued. Valérie Trierweiler, Mr. Hollande’s current partner, began an affair with him while reporting on him in the early 2000s, when he was a member of the National Assembly. She grudgingly passed on a television news job this fall and stayed at the magazine Paris Match as a critic. Ms. Pulvar replaced David Kessler, who left to join Mr. Hollande as an adviser. Also, a legal affairs reporter at Europe 1 radio became the spokesman for the justice ministry. A political reporter at Les Échos, a leading French financial newspaper, joined the prime minister’s press office. The public media have gone through postelection changes too. In October, Mr. Hollande named a new director for the country’s international radio and television news networks, RFI and France 24. He has pledged to reform the law that allowed him to make that appointment, but not until next year. The directors of Radio France and France Télévisions, both appointed by Mr. Sarkozy, are expected to be replaced. The current law, which makes the naming of public media chiefs a presidential prerogative, was introduced by Mr. Sarkozy in 2009. At the time, commentators called the measure a power grab. Mr. Sarkozy said it was meant to remove a layer of “hypocrisy” from the appointment process, which was controlled by a handpicked government council. The public media no longer serve as state propagandists, as they effectively were until at least the late 1960s, but remain under government “oversight,” said Jean-Marie Charon, a sociologist who studies the news media. Private publications are also beholden to the state, at least financially. The government provided $1.5 billion in subsidies to them last year. Publications on the left are struggling to “find the right distance” from the government, Mr. Charon said. The jubilation that dominated political coverage last summer in Libération, Le Nouvel Observateur and Le Monde has since given way to acrimony. Whichever way the French news media lean, the departure of Mr. Sarkozy has left many outlets yearning for more excitement. American Racism?! In Racist U.S., Says French Media, "The Post-Racial Era Will Still Have to Wait"
And so we here we have it: as more than a few of us have been predicting over the years, including myself in an in-depth post before the 2008 vote, the 2008 election of Barack Obama would not end the endless accusations of racism and/or cluelessness towards the average (white) American — nor indeed would Obama's reelection four years later. … the basic truth about racism is as follows: racism is far less an accurate description of an attitude prevalent in a given society, in a given individual, than it is a weapon that is wielded to demonize one's opponents while making oneself appear heroic by parroting (and by doing nothing else than parroting) politically correct platitudes. More often than not, in other words, the fight against alleged pockets of racism is nothing more noble than a self-serving act of self-praise. As James Taranto puts it (thanks to Instapundit), Antiwhite bigotry has gone mainstream, and indeed, over here in Europe, Louise Couvelaire proves that by stating in Le Monde, aka France's newspaper of record, that four years after the election of the first African-American president, "the black community and minorities in general have reason to worry." Because no candidate has received such an important part of the white vote since Ronald Reagan as Mitt Romney has, it turns out that (to use the old formula) "racism has reared its ugly head". Because "several hundred students" at the University of Mississippi burned signs with the name of Barack Obama while shouting racist slogans (even the Huffington Post raises its eyebrows by deliberately referring to this — rare — event as " 'riots' " with cynical-sounding quotation marks), The Post-Racial Era Will Still Have to Wait, as the title of her article says. The Le Monde writer ends her article with some quotes from a Professor of African-American Studies. Mark Naison of… Fordham university, a paragon of tolerance and free speech as is well known, claims that the Republican Party's "main motor is fear and white anger against people of color or minorities." Il n'aura pas fallu attendre longtemps. A peine quelques minutes après l'annonce de la victoire de Barack Obama, le 6 novembre, plusieurs centaines d'étudiants de l'université du Mississippi ont brûlé des pancartes portant le nom du président et scandé des slogans racistes. …L'élection, en 2008, du premier président afro-américain de l'histoire des Etats-Unis devait consacrer l'avènement d'une nouvelle ère post-raciale. Quatre ans plus tard, la communauté noire et les minorités en général ont de quoi s'inquiéter. Fin octobre, un sondage de l'Associated Press indiquait que 51 % des Américains exprimaient des idées explicitement racistes, contre 48 % en 2008, et que 56 % d'entre eux affichaient des comportements implicitement xénophobes, contre 49 % il y a quatre ans. Depuis son discours historique de mars 2008 intitulé "De la race en Amérique", le locataire de la Maison Blanche, refusant d'être le "président des Noirs", joue la prudence. Il n'a jamais abordé ouvertement la question pendant son premier mandat. … "La rage d'une partie des Blancs qui s'est exprimée pendant la campagne de 2008 ne présageait rien de bon et elle s'est encore intensifiée, analyse Mark Naison, professeur d'études afro-américaines à l'université de Fordham, à New York. L'Amérique ne sera bientôt plus un "pays de Blancs" et ça les terrifie." Les plus optimistes espèrent un rapport de forces plus égalitaire entre les différentes communautés, mais au Parti républicain, la partie s'annonce délicate. "Leur principal moteur est la peur et la colère des Blancs envers les gens de couleur ou encore les gays, poursuit Mark Naison. S'ils lancent une opération de séduction envers les minorités, ils perdront leur électorat de base, mais s'ils ne le font pas, ils n'auront aucune chance de gagner. Il va falloir qu'ils trouvent un autre sujet rassembleur." Did U.S. Intruders Manage to Hack the French Presidency's Computers Through a FaceBook Trick? According to Le Monde's Philippe Bernard and Corine Lesnes, the French presidency's computers were hacked last May, and the finger seems to point at the United States. Right before the presidential election, claims a Le Telegramme article by journalist Jean Guisnel, "secret notes and strategic plans" were filched by intruders who made their entrance to the Élysée Palace by contacting French government workers through FaceBook and asking to become their friends, subsequent to which they managed to get their hands on the workers' IDs and passwords. In Washington, Homeland Security Department spokesman Matthew Chandler has "categorically denied" that the United States has "participated in a cyberattack on France … one of our closest allies", but the French government has not yet formally denied the news reports that appeared in the L'Express weekly. Contrairement à l'administration américaine, le gouvernement français n'a pas formellement démenti les affirmations de L'Express, mercredi 21 novembre, sur un piratage américain des ordinateurs de l'Elysée. La porte-parole du gouvernement, Najat Vallaud-Belkacem, s'est contentée de signaler qu'elle n'avait pas d'information précise, ajoutant : "Je ne crois pas que nous ayons de quelconques inquiétudes." De source diplomatique, on indique que la France attend des explications du gouvernement américain. Dans son édition publiée mercredi, l'hebdomadaire affirme qu'en mai, quelques jours avant le second tour de l'élection présidentielle française, les réseaux informatiques de l'Elysée avaient été piratés, permettant à des intrus de récupérer "des notes secrètes et des plans stratégiques". … A Washington, le directeur des communications du ministère de la sécurité intérieure, Matthew Chandler, a "catégoriquement démenti" que les Etats-Unis aient "participé a une cyberattaque contre la France". "La France est l'un de nos alliés les plus proches. Notre coopération dans le partage du renseignement, dans l'application de la loi et dans la cyberdéfense n'a jamais été plus étroite et elle demeure essentielle pour lutter efficacement conte la menace commune du terrorisme", a-t-il indiqué au Monde. Ce démenti concerne-t-il aussi l'agence de contre-espionnage cybernétique créée en 2009 par Barack Obama (USCybercom) qui dépend du Pentagone ? Absolument, a assuré le porte-parole. 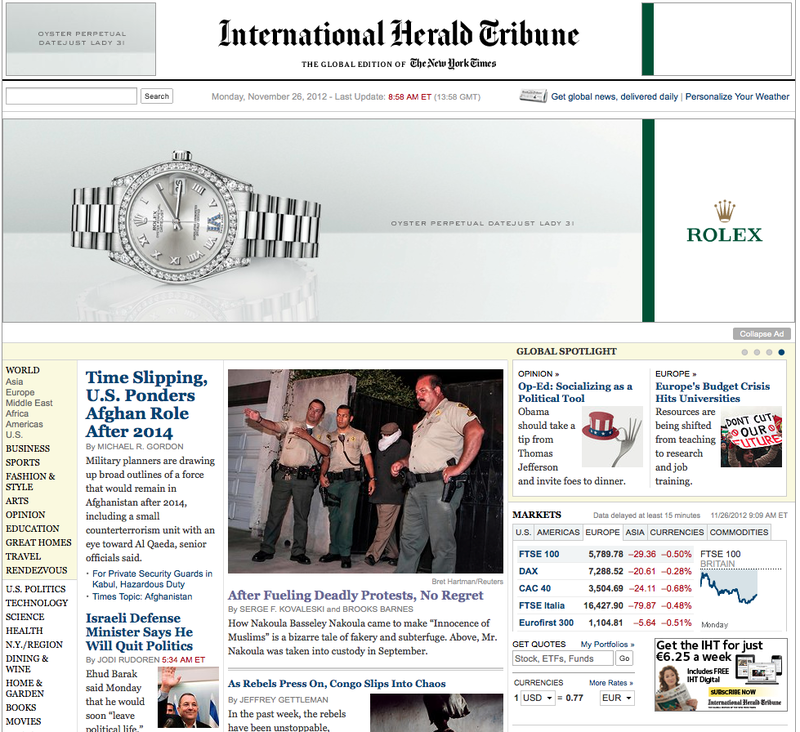 With a prime, central spot on the New York Times homepage, Serge Kovaleski and Brooks Barnes print a long story (I almost wrote an in-depth story) in the newspaper of reference that perpetuates the legend that the four deaths in Benghazi were caused by a video on YouTube — suggesting in the process that Nakoula, besides living "a life in shambles", is a heartless person without any tolerance for people and things Muslim, one who, if he were truly a generous (read: a leftist) soul, would confess to his erroneous ways, make apologies, and try to atone for said errors. Fuming for two months in a [Los Angeles jail cell], Nakoula Basseley Nakoula has had plenty of time to reconsider the wisdom of making “Innocence of Muslims,” his crude YouTube movie trailer depicting the Prophet Muhammad as a bloodthirsty, philandering thug. 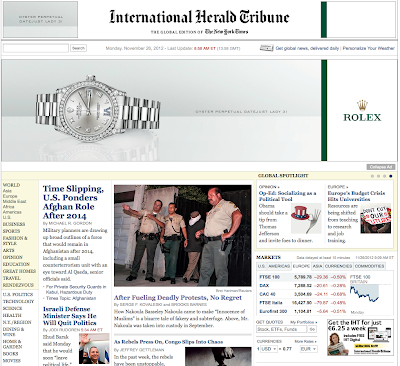 notes Landon Thomas Jr tersely in the International Herald Tribune. At least not until Nigel Farage, the Brussels-bashing leader of Britain’s fastest-growing political party, gets up to speak. The vast majority of the European Parliament’s 754 members, as they process the torrent of rules and regulations that Europe bestows upon them, are not inclined to question why it is that they are there. The pay and perks are generous for those elected to five-year terms in low-turnout elections throughout the European Union’s 27 member countries. The mission — to extend the sweep of European federalism — is for most a shared one. But for Mr. Farage, who has waged a 20-year campaign to get Britain to leave the European Union, Strasbourg has become the perfect stage to disseminate his anti-E.U. message by highlighting the project’s bureaucratic absurdities and spendthrift tendencies, and more often than not, to mock with glee the most prominent proponents of a European super state: the head of the European Commission, José Manuel Barroso, and the European Council president, Herman Van Rompuy. His speeches mix the pitch-perfect timing of a stand up comedian — he once told Mr. Van Rompuy that he had the charisma of a damp rag and the appearance of a bank clerk — with a populist passion that critics say approaches demagoguery, and they have become wildly popular on YouTube. Now, his United Kingdom Independence Party is on the verge of replacing the Liberal Democrats as the country’s third largest political party behind the Conservatives and Labour. The very thought of raising a pint with either Mr. Barroso or Mr. Van Rompuy elicits a cigarette-scarred chortle from Mr. Farage. Indeed, with his dapper suits, cufflinks and love of a wine-soaked lunch, Mr. Farage can come across as a caricature of a pasthis-prime, City of London financier — a loudish type sounding off on cricket and the latest bureaucratic atrocity in Brussels that one frequently encounters in pubs in the wealthy suburbs surrounding the British capital. But as politicians in Europe and Britain are now realizing, Mr. Farage’s ‘‘damn the technocrats’’ rallying cry — raw, profane and borne of genuine conviction — is not so easily dismissed. At least, not at a time when officials from the International Monetary Fund and the European Central Bank are calling the shots in Greece, Portugal and Ireland. Not when a former European commissioner is prime minister of Italy. And increasingly ineffectual career politicians in France, Spain and Britain are struggling to connect with angry voters. That, he said, can manifest itself in the form of the U.K. Independence Party. Or, he continued, it can result in ‘‘desperate people doing desperate things,’’ like the extreme nationalism of Greece’s neo-fascist Golden Dawn party, which has ridden a tide of anger against immigrants and Greece’s worsening economy. Still, there is no disputing U.K.I.P.’s rise in Britain under Mr. Farage. In the 2009 election for the European Parliament, U.K.I.P. came in second to the Conservatives, taking 16 percent of the vote, and in 2014 many expect it to become the number one vote getter. In British elections, U.K.I.P.’s vote share is smaller, due to its narrow focus on leaving the European Union. It tallied just 3 percent in 2010, not enough to secure a seat in Parliament. According to recent polls, however, U.K.I.P.’s support has shot up to between 8 and 10 percent, putting it about equal with the government’s much maligned coalition partner, the Liberal Democrats. For Mr. Cameron, currently under attack from the potent euro-skeptic flank of his Conservative Party, which is pushing him hard to reduce what the country pays to the European Union each year, the trend is a disturbing one. In fact, Mr. Farage, who is 48, and Mr. Cameron, two years younger, share common origins. Both sons of stockbrokers, they grew up in prosperous villages in the heart of Tory England, where skepticism toward Brussels runs deep. But as their later paths diverged, so did their views toward Europe. Mr. Cameron went off to Eton and Oxford, and then straight to the Conservative Party, where he rose to the top as a smooth conciliator, pledging to halt the party wars over Europe that ended Prime Minister Margaret Thatcher’s political career, and plagued the Tories throughout the Labour ascendancy from 1997 to 2010. Mr. Farage spurned college for a trader’s life in the city of London in 1982, and 10 years later became radicalized when he witnessed firsthand the ejection of the pound from the Europe-imposed system of fixed exchange rates. He concluded that any power ceded to Europe, be it monetary policy or otherwise, would be sheer folly. Now, with Mr. Farage on the rise and Mr. Cameron struggling to keep his party, not to speak of his government, united the question of how much Britain gains from being part of Europe has once again come to the fore. Last year, in net terms, Britain paid $16 billion to the bloc. But according to a recent study by the economist Tim Congdon, himself a U.K.I.P. member, if you include the cost of regulation, waste and misallocated resources, the annual price of membership rises to $238 billion a year, or about 10 percent of Britain’s economic output. 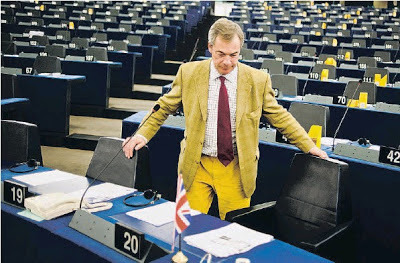 Perhaps the most egregious example of profligacy is the very spot where Mr. Farage has found his fame — the European Parliament. As most of the legislative work is done in Brussels, the quite grand building finds itself in use for just two days each month. Analysts estimate that it costs the European taxpayer about $250 million each year to transport 754 parliamentarians, several thousand support staff and lobbyists to this sleepy French city on the German border once a month. Which means that more than three weeks out of every four, this towering edifice of glass and steel remains mostly empty. Mr. Farage lights another Rothmans and shakes his head at the absurdity of it all. ‘‘I just would like for my grandchildren to read someday that I did my part in saving my country from this lunacy,’’ he said with a weary sigh.